The Front Door is now Glazed! 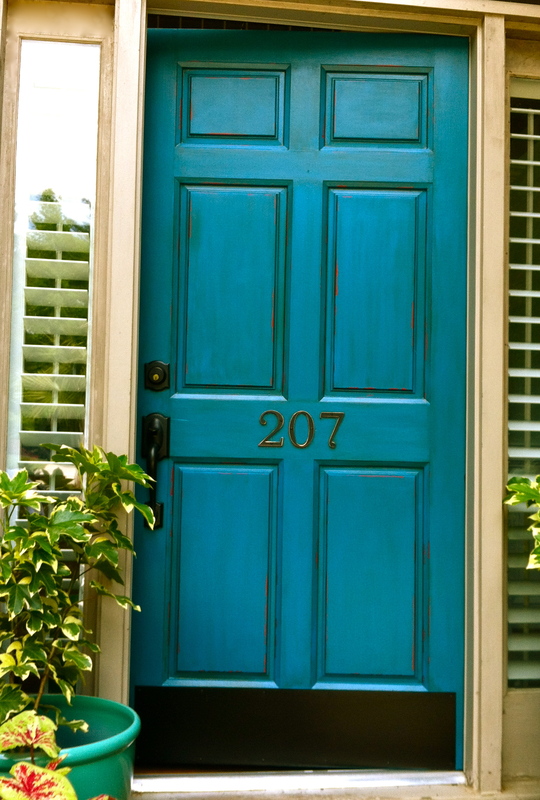 Okay, I glazed the front door with a “mocha” glaze by Valspar and it turned out great! The glaze actually made some of the blue paint come off when I rubbed the glaze off with a cloth and it looked pretty cool so I intentionally rubbed some of the paint off to let the red paint show through. Wow! That looks really great! My door is still boring white, but this post has inspired me. Now, to pick a color. Thanks! Picking a color is always the hardest part, remember it’s just paint and if you don’t like it you can always paint over it. Check back tomorrow because I will be posting a photo of the finished door now that the bricks are scrubbed and the containers are planted! Can you use the glaze on any surface or does it have to be wood? Hi Melissa! 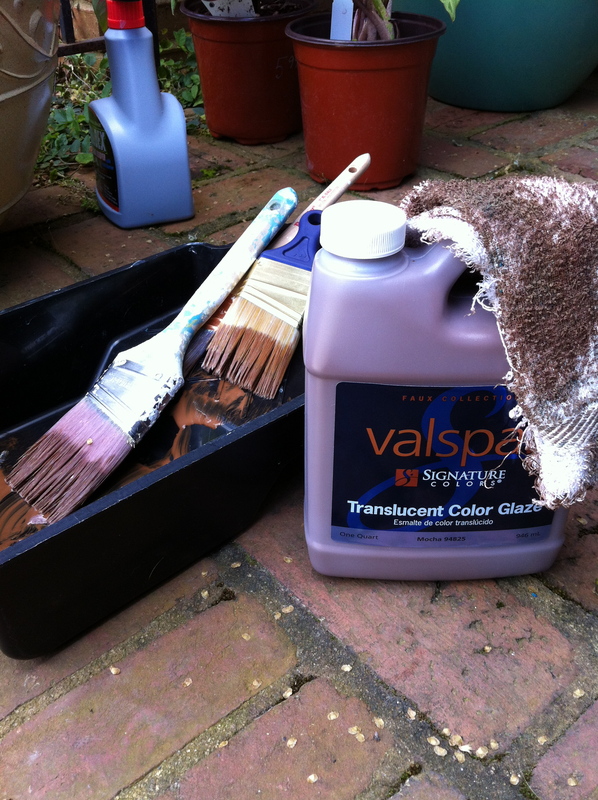 You can use it on just about any painted surface. I have used it on metal and plastic with great results. It really needs a protective coat of polyurethane to keep it from scratching off and that is going to be my next step on the door, it’s supposed to rain tomorrow so I have to get it done before then! I’m doing my door exactly like yours. I have a boring red front door. Thanks!!! I have a front door that seems to have a fiberglass surface with a pale wood look. It is worn in places. I would like to give it a warmed up look without necessarily painting it. Any suggestions? My house is light gray with white trim. Hi Karen, I think a gel stain may do the trick. General Finishes has one that I like a lot called Java Gel Stain. It is dark brown so it may be a little stark if you don’t like a dark color. They may have a weathered gray that would work better. I know Minwax makes a weathered gray stain. Hope that helps! Once you were done with this project did you finish it with some type of polyurethane or finishing product? No I left it as is and it still in good shape. I have a white old fiberglass ugly exterior front door. I want to paint turquoise and glaze with a dark glaze with the result to look like like it’s aged with black but don’t want any white peeking out. 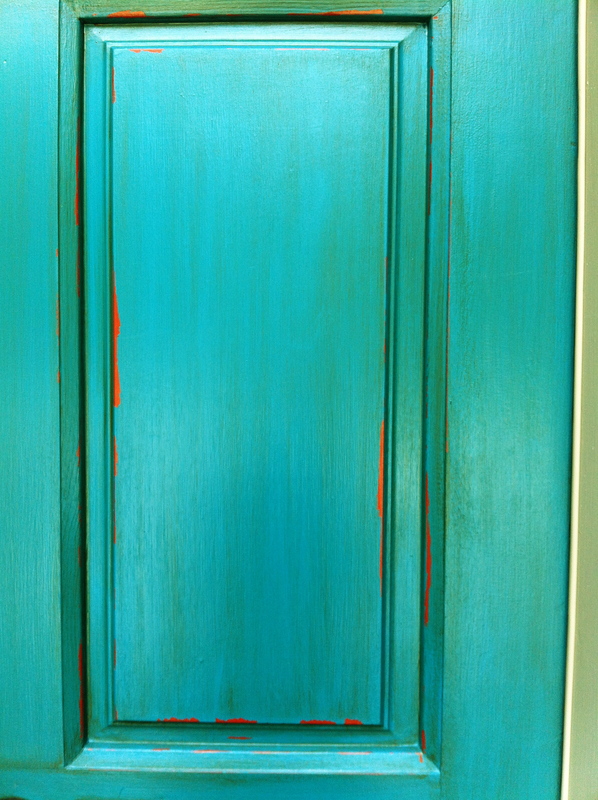 Is there anything I need to do to prime the door besides clean it to achieve the turquoise soot antique look? I saw your suggestion about polyurethane after the door is finished. Hi Audrey, I would probably use a coat of bonding primer before painting the turquoise. Since it’s an exterior door there would be more opportunity for the paint to peel off. Hope that helps and post your finished door! Going to try this on my door.